(upper) The Imperial train was operated when Belgian King, Their Majesties King Albert and Queen visited to Japan. EF5861 with Belgian and Japanese flags hauled the train. 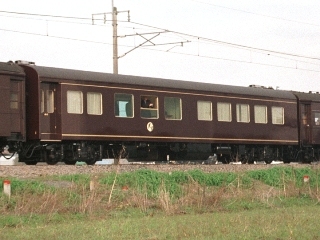 (left) The new Imperial car No.1. (right) 6000 enthusiasts were alongside with the Ryomo Line. 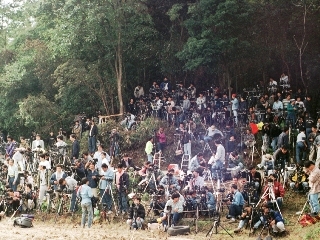 Photo at Iwafune/Ohira-shita on 24 Oct, 1996. 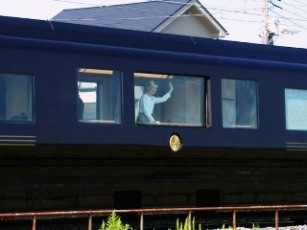 (upper) The Imperial train was operated on the Ishinomaki Line for the observation of the Emperor and Empress on the National Sports Festival in Miyagi, Japan. DD51842 with Japanese flags hauled the train. (left) Single loco DE10 ran as a pilot, followed by the Imperial train. (right) Their Imperial Majesties returned a salute from the Imperial car. Photo on 14 Oct, 2001. (upper) The Imperial train was operated on the Sotobo Line for the observation of their Imperial Majesties on the National Sports Festival in Chiba, Japan. E655 series EMU with Japanese flags was used. (right) Her Imperial Majesty returned a salute from the Imperial car. Photo on 26 Sep, 2010.